Kaitlyn Dunnett/Kathy Lynn Emerson here, today providing some follow up on a couple of my posts here at the Maine Crime Writers blog. Back in October, in Books, You Say I wrote about being overwhelmed by the number of author copies of backlist books I’ve accumulated. I asked for suggestions and many of you responded to offer some excellent ideas. I’ve been a little slow to put them into practice, but I thought I’d share how one of them is going. To start the new year off right, I sent an email to the fourteen public libraries closest to my house. I introduced myself and included a list of the titles that I have available to give away. To tell you the truth, I was a little disappointed in the response. Of those fourteen, only six replied. On the other hand, all six have taken me up on my offer. They checked their shelves and got back to me with the titles they were missing and I’ve been slowly but surely delivering them, something that has the added benefit of giving me a chance to meet the librarians in person. In addition, two of them have offered to use their book mailing system to send copies of my books to libraries farther afield. Since I do intend to branch out, making the same offer to other libraries around the state, this is especially welcome. Let’s face it, postage can get expensive, even with media mail, and when you drive more than twenty miles one way, the cost of gas can become an issue, too. The next round of emails will go out shortly to libraries I’ve visited to do Sisters in Crime panels and other events. Any Maine librarians reading this, feel free to leave a comment with your contact information and I’ll make sure you receive that email, too. See those blue benches? I’d have guessed wrong and said there were chairs. Another recent blog (Coming up Short) appeared earlier this month and concerned my current work-in-progress, the first book in a new cozy series set in rural New York state and featuring an amateur detective who is in her late sixties. I was lamenting the fact that, although I was happy with the draft I’d just finished (number two out of the four or five revisions before it’s turned in to my editor), it is 12.000 words short of the minimum required by my contract. I asked for feedback as to what additional material readers like to see in a cozy and what they consider unnecessary padding. I also mentioned that I did have one idea for a humorous scene where my character, Mikki Lincoln, who has moved to New York from Maine, visits the DMV to get a new driver’s license. The manuscript is still “resting” while I’ve been working on a different project, but there have been two developments. First, my editor emailed to ask if I was wedded to the title Deadly Edits for this book in which the sleuth works as a book doctor to eke out her retirement income. That led to some very funny three-way exchanges (me, my editor, and my agent) full of title suggestions tied to the character’s profession. In the end, we all agreed on the best one: Crime and Punctuation. The other development has to do with the DMV scene. I made up the home town Mikki returns to after fifty years away, but it is located in the real Sullivan County. 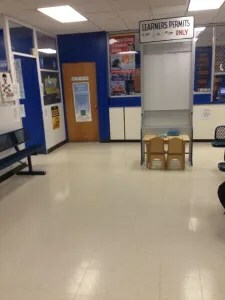 As someone with a reputation for doing her research, that meant I needed to know what the real DMV office looks like and what procedures Mikki has to follow to get her driver’s license. Only some of that research can be done online. Fortunately, I still have high school friends in the area, one of whom lives right there in Monticello, where the local DMV office is located in the Sullivan County Government Center. I emailed to ask some questions. She responded by going undercover for me and taking a whole series of photographs to show me the route to the DMV offices and what they look like inside. She got some suspicious looks, and had to take a number, but no one complained, and now I can get the details right. I especially like the shot below with what looks like a child-sized desk under the learners’ permit sign. Early next month, I start the next revision. Stay tuned for updates. 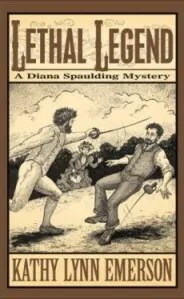 This entry was posted in Kaitlyn's Posts and tagged backlist titles, Crime and Punctuation, follow ups, Kaitlyn Dunnett, Kathy Lynn Emerson, libraries, Mikki Lincoln Mysteries. Bookmark the permalink. Looking forward to the new series. I am retired and love to read about retirees. Thanks, Gram. I’m having fun writing it so I hope that will come through to readers. That tiny desk is hilarious! I will forward the link to this to my librarian at Walker Memorial Library in Westbrook and ask her to check the collection. If she’s interested, maybe I can coordinate to get the books from you and deliver them to her. Kind of a pony express thing. Always good when old friends can do the groundwork for you. My best friend from college did that for us when we went to a wedding in Des Moines last summer. He’d been a librarian there and his suggestions of what to see in our free time was spot on. I bet the DMV scene comes out accurate and funny. Real Mainer’s know the least friendly people seem to gravitate to work in those places. I hope you’re right. 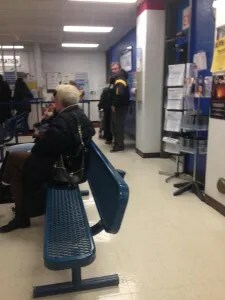 Right now it’s just a collection of nebulous ideas, one of which came out of our recent attempt to get answers from the social security office in Auburn, which has much the same feel to it with the added attraction of an armed security guard.